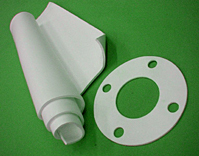 Phillips ePTFE sheeting is made from virgin PTFE and is softer and more conformable than many other brands. The density of the sheet is 0.40 +/-.15 s.g. and the thickness tolerance is +/-25% of the nominal thickness. Also, unlike many other brands, Phillips offers standardized distributor pricing that simplifies the purchasing process.